Born and raised on the Big Island, Scott Hamilton is currently a sophomore at the University of Hawaii at Manoa where he is pursuing a degree in civil engineering. 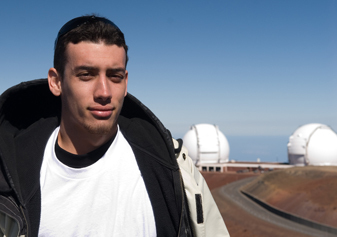 Scott’s interest in engineering came from taking related classes at his high school, Kamehameha – Hawaii Campus. On Scott’s free time, he enjoys playing basketball, volleyball, weight lifting and music production. An important key to any successful business or observatory is proper documentation and organization, especially in engineering where documents and drawings are constantly being accessed, modified and studied. At the forefront in documentation and design for engineering is three-dimensional (3d) modeling. In order to provide better documentation at W.M. Keck Observatory, I am working with the mechanical engineering group to model a 3d rendering of the Keck telescopes in SolidWorks, a software program that specializes in 3d modeling of mechanical designs. The main focus of this project is to create a 3d model of the area around the left Nasmyth platform of the Keck 2 telescope. The first section of my project is modeling the hydrostatic bearings systems, which includes the hydrostatic shoe bearings, the axial elevation bearings, axial pad splash guard and the elevation radial pads. This system keeps the elevation ring oiled and lubricated so that the telescope can move in elevation. The second part of my project is to model the yoke structure beneath the left Nasmyth platforms. This structure supports the Adaptive Optics enclosure. The finished modeling of these sections will be placed into a large Keck 2 Telescope assembly model, where it will be released for access to all of W.M. Keck Observatory.